Back at the school, we are introduced to the new head janitor that the Principal and Vice Principal were discussing in the previous issue. And boy oh boy, does he appear to have his work cut out for him. 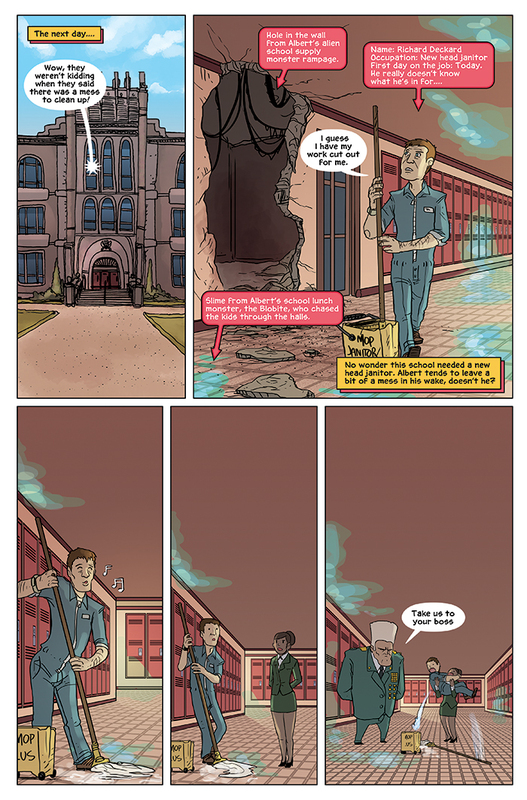 In the just previous two stories, Albert has already wrecked the halls of the school with his adventures. First it was a giant alien school supply monster. Then it was a bit jello-like alien lunch, the Blobite. Well, these halls don’t just clean themselves, and now it’s up to Janitor Deckard to clean up the mess. However, he has some surprising arrivals with Col Ty Fighter and Major Neck Payne arriving, asking to see the Principal. How do we think THAT meeting is going to go? Find out on Friday!